The implication appears to be if the pings detected in the Southern Indian Ocean are determined not to have originated from the missing plane ... the flight path direction after it reached the Malacca Straits is unknown. The four underwater signals that search teams detected are still "the most promising lead" investigators have in the search for the Boeing 777, Angus Houston told CNN's Anna Coren on Monday. But are they all pings from the plane's data recorders? The pings have played a key role in shaping the search for the plane, which went missing March 8 during a flight from Kuala Lumpur to Beijing with 239 people onboard. Houston told CNN the hunt for the plane is even more difficult than that for Air France Flight 447, which disappeared in the Atlantic Ocean in 2009. "The big difference between Air France 447 and MH370 is that the last known position, in terms of MH370, is at the top of the Malacca Straits, and then the aircraft continued to fly for an extended period after that," Houston told CNN's Anna Coren on Monday. "Whereas Air France, they had a very good last known position, which then turned out to be very close to where the aircraft was eventually found." I may not comprehend the satellite data but I can do simple math. The reported Maltive sighting took place approximately seven hours following MH370 last contact with air controllers ... less than one hour after departure. The plane left Kuala Lumpur with enough fuel for approximately ten hours of flying. 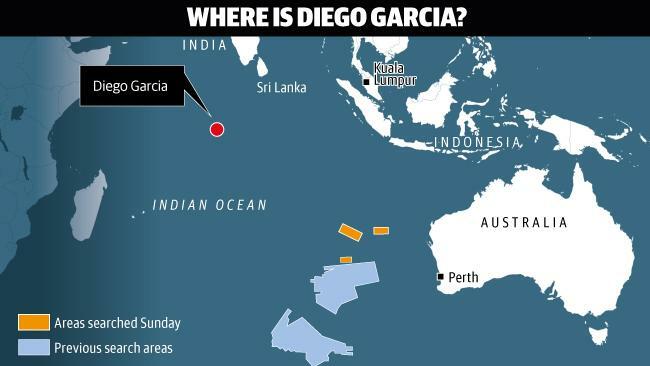 My calculations imply that the alleged Maltive sighting and ... the possible Diego Garcia connection should be investigated in the process of elimination. The sightings, reported by a local news outlet, would have occurred more MORE THAN SEVEN HOURS AFTER THE PLANE, carrying 12 crew and 227 mainly Chinese passengers, LOST CONTACT WITH AIR CONTROL and took its sudden westward turn during a flight from Kuala Lumpur to Beijing in the early hours of Saturday March 8. Malaysia Airlines has confirmed that MH370 was fuelled for at least eight hours of flight, and the aircraft’s Kuala Lumpur-Beijing route typically lasts only six hours. Furthermore, aircrafts generally carry about two hours’ worth of fuel on top of what is needed. Have MH370 searchers been looking in the wrong place for the missing plane? CNN's Rene Marsh reports. The missing Malaysian jetliner was deliberately diverted and continued flying for more than six hours after losing contact with the ground, meaning it could have gone as far northwest as Kazakhstan or into the Indian Ocean’s southern reache, Malaysia’s leader said Saturday. Prime Minister Najib Razak’s statement confirmed days of mounting speculation that the disappearance of Malaysia Airlines Flight MH370 to Beijing more than a week ago was not accidental. The revelation comes as CNN has learned that a classified analysis of electronic and satellite data suggests the flight likely crashed either in the Bay of Bengal or elsewhere in the Indian Ocean. PETALING JAYA: A news portal report suggesting that bodies found near the Bay of Bengal last weekend were from missing Malaysia Airlines (MAS) flight MH370 is mere speculation, a Bangladesh High Commission official here said. The mission’s defence attaché, Air Cdre M. Abul Bashar, said his country’s navy was aware of the discovery of the bodies. However, the bodies were of Bangladesh nationals and not from flight MH370, he said when contacted Monday. News portal tazakhobor.com reported Sunday that fishermen and locals had found at least 20 unidentified bodies floating along the Meghna River at the mouth of the Bay of Bengal. Pictures of the bodies taken by locals were uploaded to the site. According to the portal, it was presumed that these individuals had died several days earlier and identification was made difficult due to the bodies’ state of decomposition. The portal also suggested that the bodies came from flight MH370. However, the river is notorious for ferry accidents that claim a few hundred lives every year. Bangladeshi authorities are currently working with Malaysia to locate the missing airliner, after appeals by Prime Minister Datuk Seri Najib Tun Razak to his Bangladeshi counterpart Sheikh Hasina. GeoResonance had consulted its clients before approaching the media with the MH370 wreckage claim and its clients had encouraged the firm to alert the authorities. GeoResonance’s clients mainly comprise mining companies searching for minerals, oil and gas hidden deep under ocean floors. Having read that thus far only Bangladesh navy ships had gone to investigate the GeoResonance claims, he said: “As far as Bangladeshi Navy checking our findings, we firmly believe that our findings have not been checked at all. “The media mentioned ‘three Bangladeshi ships scouring the Bay of Bengal’. However, what does ‘scouring’ mean? “We reported the precise location. Given the margin of error, the reported area size was only 500 sq metres! What was required is to send just one ship to the specified coordinates and check the location with a sonar. “GeoResonance remains quietly confident on our reported finding in the Bay of Bengal. Malaysia said last night it was investigating a claim by an Australian firm that it had potentially discovered the wreckage of flight MH370 - some 5,000 kilometres from where search teams have been focusing their efforts. Acting Transport Minister Hishammuddin Hussein said Malaysia was working to "assess the credibility of this information", after the company said it had identified in the ocean chemical elements used in the construction of aircraft. 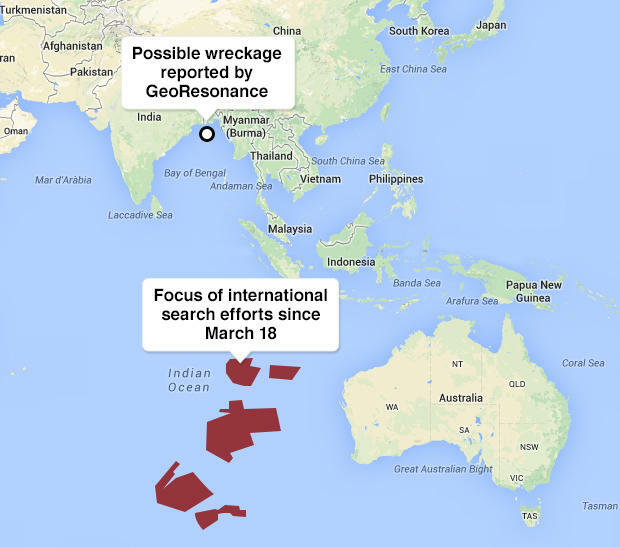 GeoResonance told Australia's 7News that it had used hi-tech equipment to scan more than two million square kilometres of ocean before identifying an area in the Bay of Bengal containing "aluminium, titanium, copper, steel alloys and other materials". The company's David Pope said the team had been "very excited when we found what we believe to be the wreckage of a commercial airliner". He said the team then verified its findings by analysing images of the area taken three days prior to the crash. "The wreckage wasn't there prior to the disappearance of MH370," Pope told 7News. The GeoResonance website states the firm can "detect the nuclei of targeted substances" at depths of up to 5,000 metres. THE NEXT PHASE OF THE SEARCH? There now appears to be a lack of any wreckage or "conclusive" evidence that would indicate MH730 turn in a southerly direction after passing the Malacca Straits on the morning of March 8, 2014. Could the implication be that that independent analysts should be afforded the opportunity to study Inmarsat's raw satellite data and ... could it be that the official search should be expanded to both the north and south-west of the Malacca Straits ... the last detected position of the airliner by Inmarsat? 1. The Malaysian pilot was on a government sanctioned mini 9/11 targeted mission in the name of Allah. He was embracing a spiritual purpose when he turned that plane around and headed west across the Malaysian Peninsula towards the Indian Ocean and ... then continued west to the Maltives Islands and ... then turned south toward the Diego Garcia military base. 2. The Malaysian pilot crashed MH370 into a strategic target on Diego Garcia or ... the plane was shot down over the island by the US Military when it was realized an attack was imminent. Either way the implication is that the wreckage of MH370 is not in the ocean. 3. Britain/US and Malaysia have respective underlying political reasons to distract the world's attention away from Diego Garcia as the location where MH370 came out of the skies on the morning of March 8, 2014 and ... the I don't have a clue why the Australian PM is comply with the deception. 4. Respective searches for MH370 in the South China Sea and the South Indian Ocean was an attempt by Britain/US to divert world attention from a top secret US Military base in the Indian Ocean and an attempt by Malaysia to distract from a government sanctioned a mini 9/11 attempt. 5. The Malaysian pilot had planned and practised on his flight simulator how he would render passengers/crew unconscious ... how he would reach Diego Garcia undetected ... how he would crash MH370 into a strategic target on the Island thus hindering the anti-Islam objectives of the top secret US military base. Planning would imply an adequate fuel supply to reach the Island. After a short port visit, the ADV Ocean Shield yesterday returned to the vicinity of the acoustic signals acquired by the Towed Pinger Locator in April to continue the underwater search for missing Malaysia Airlines flight MH370. The Autonomous Underwater Vehicle, Bluefin-21, was deployed from Ocean Shield yesterday afternoon but was recovered about two hours later to investigate communications problems. Work continues to rectify the issue and to date, Bluefin-21 has not redeployed. The international search effort presently includes assets from Australia, the People's Republic of China, Malaysia and the United States. The collective request from relatives of missing passengers/crew who were aboard missing MH370 ... the collective request in an open letter regarding the release of raw satellite data ... was denied by Malaysia. Malaysia on Monday ruled out releasing raw satellite data to the families of the 239 people on board the crashed MH370, as the transport ministry prepared to table a report on the outcome of a tripartite meeting in Australia on the future of the search for the plane. Commenting on the request from the families of those on board Malaysia Airlines Boeing 777-200 for the government to release raw satellite data, Acting Transport Minister Hishamuddin Hussein said it was better for the International Panel of Experts to decide which information should be made public. KUALA LUMPUR: The raw satellite data sought by the family members of passengers and crew onboard flight MH370 can only be released by British satellite telecommunications company Inmarsat, said Acting Transport Minister Datuk Seri Hishammuddin Hussein today. Hishammuddin was responding to questions by the media on the demand made by the next-of-kin for the release of all raw data, including satellite information, in their hopes that “the whole world can help look for the plane”. The families had also suggested that the government can buy over the data so that it can be accessed and analysed by outside experts. “The raw data is not in the hands of Malaysia, Australia or MAS. What needs to be confirmed or released can only be done by Inmarsat themselves,” Hishammuddin told reporters at a media briefing this evening on the still missing Boeing 777-200ER aircraft. Either Inmarsat is be not being forthcoming regarding the satellite data or Malaysia is not being forthcoming. Why should there be any hold back regarding the sharing of this data? Did Inmarsat data point Flight 370 searchers in wrong direction? It has been 69 days since MH370 went missing. After more than nine weeks, the search has now entered a Transition Phase prioritising deep-sea search. Since the last time I held a press conference in Kuala Lumpur, Malaysia, along with China and Australia have met and agreed upon the next course of action which will be jointly undertaken. Reiterating what the Deputy Prime Minister of Australia, the Honourable Warren Truss said when we met in Canberra last week – we have entered a new difficult phase which brings with it new challenges which we will overcome together. With regards to the Tripartite Ministerial Meeting, I have briefed the Malaysian Cabinet yesterday on the outcomes of the meeting and it has been deliberated. I now have the mandate to announce that the details of the Transition Phase have been approved. As previously mentioned, our three nations have agreed that the search operation has entered a Transition Phase prioritising deep-sea search. In this context, the air and surface search has been suspended. However, an Australian P3 Orion and naval ships from Malaysia, Australia and the People’s Republic of China (PRC) remain on standby in Perth for any eventuality. In the meantime sub-surface search using the Bluefin – 21 will ensure the continuation of previous efforts. 1. To re-analyze all data to verify a more accurate search area. This analysis will be conducted by the group of experts together with INMARSAT. 2. To conduct a bathymetric survey involving an extensive mapping of the seabed. It is important that the bathymetric survey and deep water search needs to be seamless. In the meeting, we have also agreed to conduct weekly conferences via video teleconferencing between representatives of the three nations to discuss the latest developments regarding the search operation. This will commence next Monday 19 May. With regards to Asset Deployment, the Tripartite Meeting has agreed that specific assets would be required for the new phase of the search and we are jointly finalising the acquisition process. Prior to that, a comprehensive bathymetric survey will be undertaken. This is so that experts can better understand the sea bed terrain to ensure the Autonomous Underwater Vehicles (AUV) and Deep Water Towed Side Scan Sonars, which are very expensive and scarce, are safely deployed. The same knowledge of the ocean floor will be required for the operation of the Remotely Operated Vehicles (ROV). The meeting also confirmed that procurement arrangements for the use of commercial contractors will be undertaken by Australia, in consultation with Malaysia. This will reinforce our strong bilateral relationship and will enhance the coordination of activities for the overall search. The procurement process will be done through an open or limited tender process based on Commonwealth standards to facilitate cost-effectiveness and best value for money. Malaysia and China will be consulted and detailed briefings will be provided at each step of the process. The meeting also emphasised the requirement that these contracts be put in place as soon as possible to ensure that search operations are not interrupted. Besides the commercial assets, Malaysia and China are also assigning specific assets for operations in this new phase. On that note, Malaysia is in the process of acquiring related assets from Petronas, SapuraKencana, Boustead and Deftech. It should be noted that, any services that will or may be provided by government agencies of the 3 nations or other friendly nations will be complementary to the services and contribute to cost savings. Our three nations have also agreed to a proposed reception programme for any planned visit for the next of kin to Perth. In the event of confirmation of the final resting place of MH370, or identification of debris related to MH370, it was agreed that any visit will take place between two to four weeks upon confirmation. Australia has agreed to provide necessary support and information to the next of kin in terms of entry requirements to ensure their travel into and out of Australia are well taken care of. The Western Australian Government will take a lead role in organising services according to their traditions and religions, and facilitate arrangements for basic needs of the next of kin during their stay in Australia. Malaysia Airlines will be responsible for travel arrangements for the next of kin from Malaysia and all other countries. The airline will also retain broad responsibility for their support during the visit including flights, accommodation, transportation and family support. The Chinese government has also given their assurance that they will continue to actively facilitate and support matters relating to the Chinese next of kin. We understand the anguish that the families are going through and I can assure you that their interests have always been paramount in all our considerations thus far. With regards to the Technical Committee, the establishment of the International Investigation Team has fared well with the International Civil Aviation Organisation, the international aviation community and the next of kins. The announcement of the establishment of the International Investigation Team have assured them that the investigation would be conducted by an independent, competent and credible team in accordance with Annex 13 – Aircraft Accident and Incident Investigation , the Chicago Convention. In the Malaysian Cabinet meeting yesterday, the Malaysian Cabinet has agreed on establishing a specialised Communication, Coordination and Media committee which will be headed by Jailani Johari, the Deputy Minister for Communications and Multimedia. The Committee will be focusing on streamlining and strengthening effective communication between the three nations, families of those on board MH370 and other related stakeholders. This is to ensure the release of timely and transparent information which is consistent with our effort to improve communications related to this incident. As the negotiation process about further details of the operation are expected to continue for the next 1 to 2 months, Malaysia is placing a special team in Canberra which include representatives from all the committees to represent Malaysia during the period. This special team will coordinate any aspects related to the operations between Malaysia and Australia. This team will comprise of senior officials from the 4 respective ministerial committees. First Admiral Hanafiah Bin Hassan and Colonel Hassan Bin Loman will represent the Asset Deployment Committee to discuss aspects of the acquisition of assets. Captain Meor Mohamad Nor Badrishah from the Civil Aviation Department will represent the Technical Committee to discuss data analysis and investigative matters and HE Dato’ Zainal Abidin Ahmad, the Malaysian High Commissioner in Canberra will represent the Next of Kin Committee to discuss aspects relating to the Next of Kin management. 2 Officers from the newly established Communications, Coordination and Media Committee will also be placed along with the team for media affairs. To update you, a part of the team are already in Australia. I understand that the disappearance of MH370 has caused terrible anguish for the families. As pointed out by the Malaysian Prime Minister, the lack of definitive evidence combined with all the speculations that has been going around has made this all the more difficult to bear. The best we can offer at this point in time is our personal assurance that Malaysia will keep searching for the plane for as long as it takes. The British satellite firm responsible for pinpointing missing MH370’s flight path has refuted The firm said it had submitted all information to investigators leading the search. "Inmarsat's raw data was provided to the investigation team at an early stage in the search for MH370," Chris McLaughlin, the company's vice-president of external relations, told CNN today.Putrajaya’s remarks yesterday that it had yet to release its raw data. He was responding to acting Transport Minister Datuk Seri Hishammuddin Hussein’s remarks yesterday that the raw data was with Inmarsat and not with those leading the search or even with Malaysia Airlines. “The raw data is with Inmarsat, not with Malaysia, not with Australia, not with Malaysia Airlines. “So if there is any request for this raw data to be made available to the public, it must be made to Inmarsat,” he said during a press conference on MH370 in Kuala Lumpur yesterday. McLaughlin said that the company had the highest confidence in the analysis of its data, adding that the matter of releasing the information was in the hands of the investigators. CNN also reported Inmarsat as saying that the Convention on International Civil Aviation prevents the release of findings from an investigation without the consent from the state conducting the investigation. Commenting on the contradicting statements by Inmarsat and Putrajaya, CNN aviation analyst Miles O’Brien said he did not know who to believe and that one party was not telling the truth. "I don't know who to believe. But isn't it awful that it's quite evident somebody is lying here? Somebody is lying. "We're talking about something that involves a missing airliner, now 70 days. Lives lost, families shattered. And there (are) people lying about this. This is absolutely reprehensible. I can't even believe... it would be funny if it wasn't so tragic," he said. "Unfortunately, you almost get the sense that they're stalling, that there's something in there that they don't want the world to see. And that's the problem," O'Brien said. "That's why there's so little credibility right now about why this search zone has been identified." KUALA LUMPUR, May 16 — Inmarsat has refuted Malaysia’s claim that it is still holding on to the raw satellite data used to lead MH370 search teams to the Indian Ocean, insisting that it has surrendered all information over to investigators here. Hours after acting Transport Minister Datuk Seri Hishammuddin Hussein said yesterday that Malaysia does not have the raw data, the British satellite communications firm issued a statement on CNN claiming otherwise. “Inmarsat’s raw data was provided to the investigation team at an early stage in the search for MH370,” the statement said, according to a news report by the American cable and satellite TV channel this morning. According to CNN, Inmarsat “blames” Malaysia for failing to release the information.